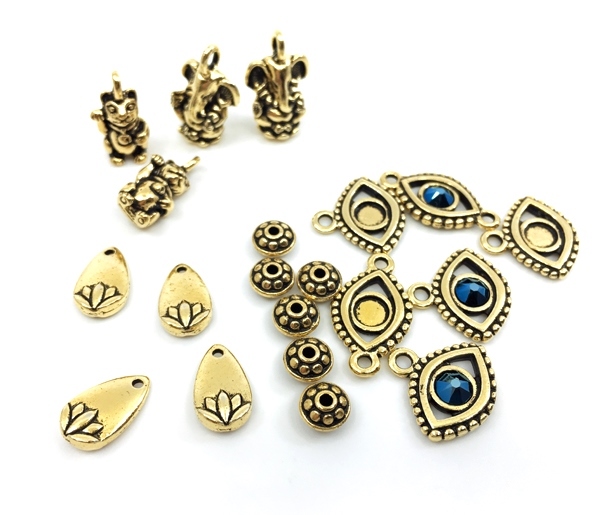 TierraCast makes beautiful pewter charms in different finishes. Over the years, I have received a number for review. Their many collections include the latest "Happy Go Lucky". 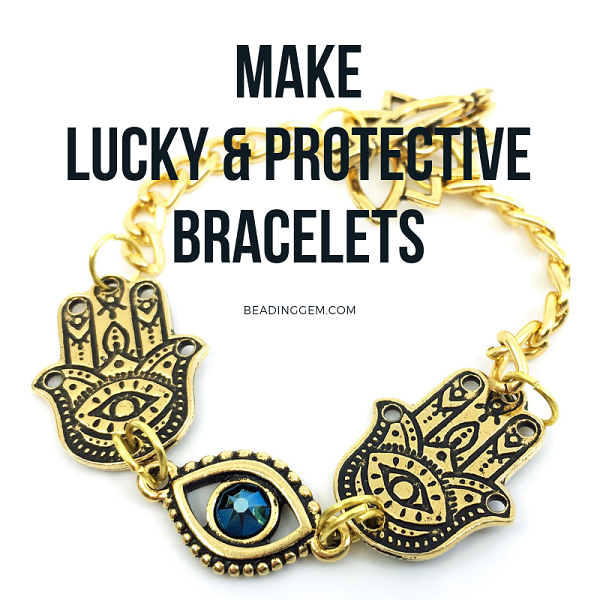 This inspired me to create a couple of "lucky" and "protective" bracelets. You may or may not be superstitious but the history of these popular iconic jewelry charms will fascinate! 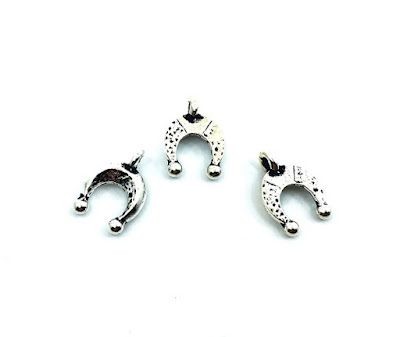 People have considered horseshoes lucky for centuries in many cultures - particularly in northern Europe and the British Isles. Horseshoes were once made from iron. Back then, people believed the mischief making fairy folk such as leprechauns, elves and goblins, were afraid of the iron metal weapons of their enemies. So something iron kept them away. The practice of hanging a horseshoe on front doors to ward of evil spirits also stems from the legend of St Dunstan, a 10th century English saint who worked as a blacksmith during his time as a monk. He supposedly recognized the Devil who came to his smithy to get his cloven hooves shod. St Dunstan bound the devil and made the shodding so painful that he managed to extract a promise in exchange for relief. The Devil supposedly promised not to enter houses with horseshoes on their doors. But no one can agree which way to hang the horseshoe is best. With the ends pointing up and thus keeping luck contained or pointing down, so that luck pours on the person entering the house? 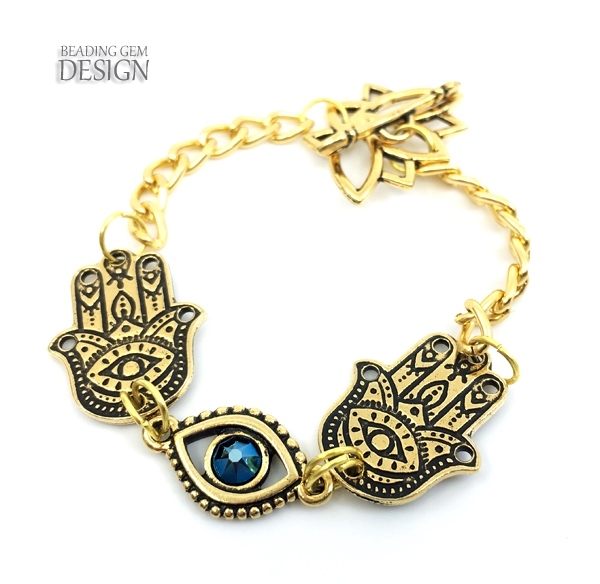 Since ancient times, people from around the world feared the evil eye, a curse or ill intent cast their way by a glance. So talismans were worn, carried or used in the home to repel the evil eye. 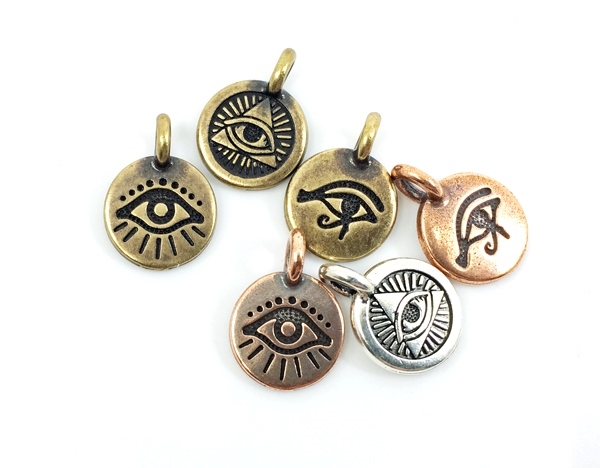 The evil eye talisman also dates back to antiquity and the belief is widespread around the world. It is especially strong in the Mediterranean area. 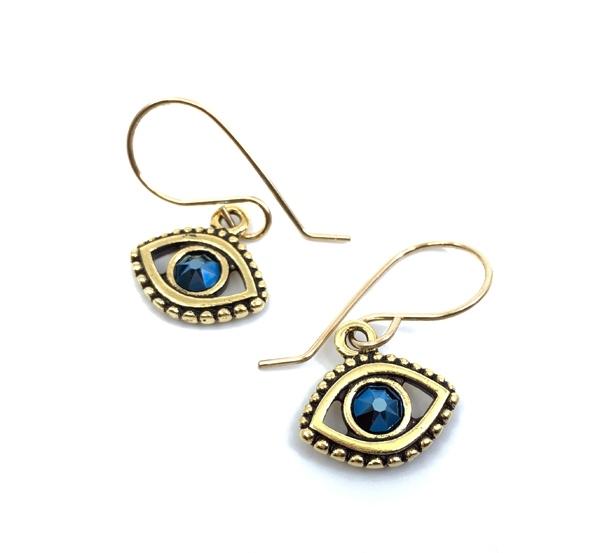 See my past post on the Nazar Boncugu which are the distinctive bright blue evil eye beads of Turkey. This palm shaped amulet is particularly prevalent in the Middle East and in North Africa. It was historically important to the Jews, Christians and Muslims. 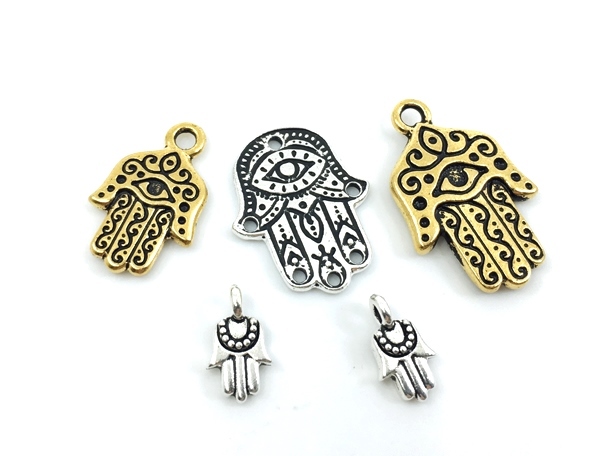 Like the evil eye charms, the Hamsa supposedly blocks malevolence. It is a protective charm which sometimes has the evil eye talisman combined in the design. Double protection! If the fingers are spread apart and/or pointing up, that signified the warding off of evil intent. If the fingers were close together and/or pointing down, good luck and blessings are bestowed. The lotus symbol is popular with yoga enthusiasts! But did you guess the sacred or Indian lotus (Nelumbo nucifera) plays a significant role in Eastern religions such as Hinduism, Buddhism, Sikhism, and Jainism? The beautiful flower grows above muddy water so it is easy to see why it is a symbol of purity and spiritual awakening. 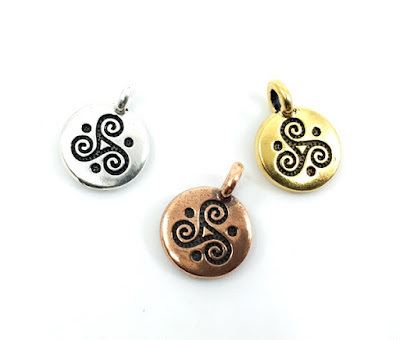 The triskelion is a 3 legged spiral symbol which is found in Europe and in Asia. It dates back thousands of years. This symbol can be seen carved in stone at Newgrange, a prehistoric tomb in Ireland which predates Stonehenge. (see my past post about Newgrange). Although the symbol existed before the arrival of Celts, in the ensuing centuries, Celtic Christians took it as a symbol of the Holy Trinity. The triskelion is difficult to interpret as the symbol meant different things to different people at different times in the past. It could symbolize life-death-rebirth, spirit-mind-body, mother-father-child, past-present-future, power-intellect-love and creation-preservation-destruction to name but a few. The maneki-neko is Japanese for beckoning cat. It is commonly used as a lucky talisman. The charm looks like the cat is waving. It is because the Japanese way of beckoning is opposite to ours. BTW if the right paw is up, it means it is bringing good luck to you. If the left paw is up, then money is in your future! 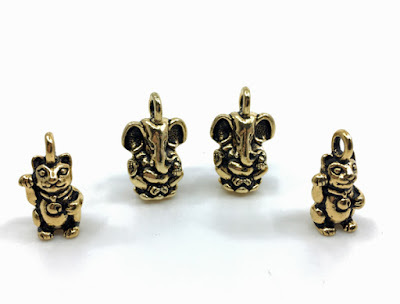 See this short video which explains the legend of the maneki-neko. Ganesh or Ganesha is actually a Hindu diety - the elephant head makes identification easy. Ganesh symbolizes wisdom and learning and is regarded as the remover of obstacles. He is the Lord of Good Fortune who provides prosperity, fortune and success. I made two lucky and protective bracelets with many of the above TierraCast charms. 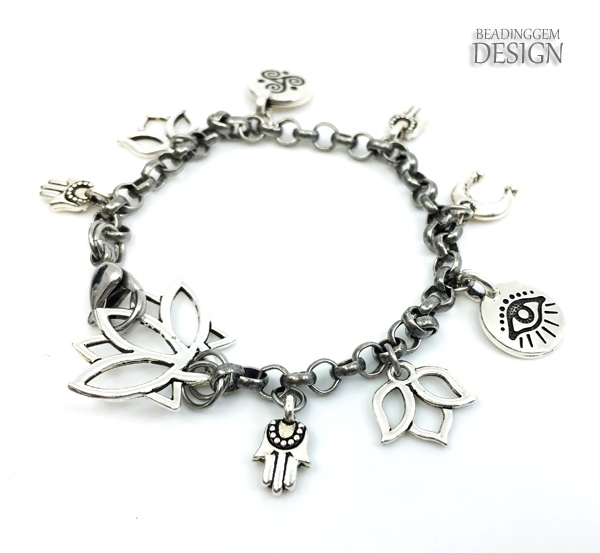 The first is a charm bracelet using a darker chain from their collection. Charm bracelets are not my favorite things to make as it requires some patience! One has to space out the appropriate charms and tediously make sure that the chosen charms go well together. I double checked how the charms hung (some had to be attached to the main chain with jump rings) by suspending the whole thing on my soldering clamps. I could then go in and fix anything that wasn't hanging right. 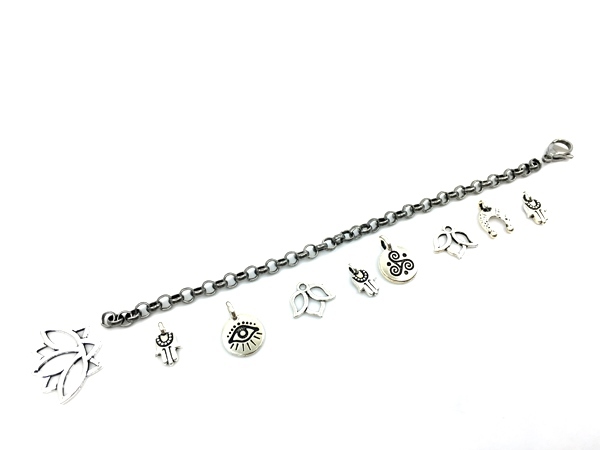 Did you notice I used the large lotus charms as part of the bracelet closures? The open design makes it easy to clip on a lobster clasp or thread through a bar and used as a toggle closure. And naturally the perfect earrings to match! 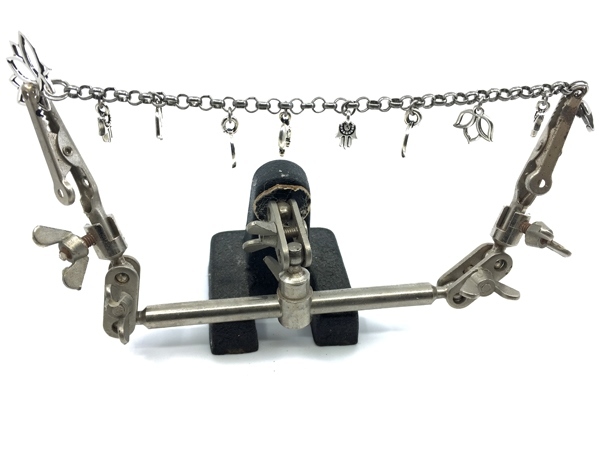 I was pretty much aware of the meaning of all those charms, except for the triskelion, so I learned something new today :) But not only this - using the soldering clamps to hold the chain is brilliant, so is the inventive clasp! Thank you for your kind words! Sometimes necessity is the mother of invention! 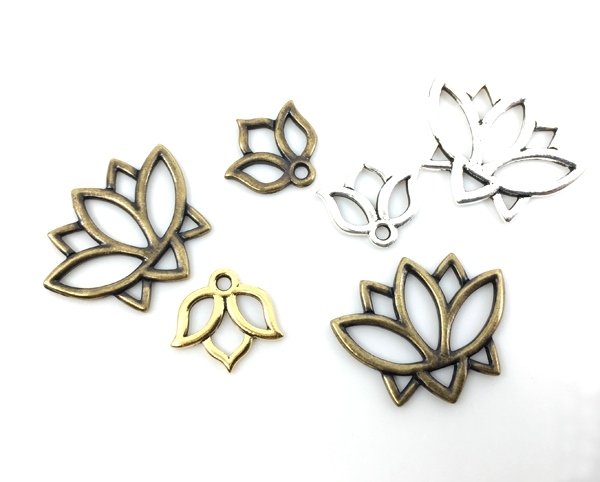 I really wanted to use the large lotus charms in some way so why not a clasp? You are welcome! It is so helpful to repurpose a tool you use for something else! As you pointed out, there is no need to buy another!